Wow! 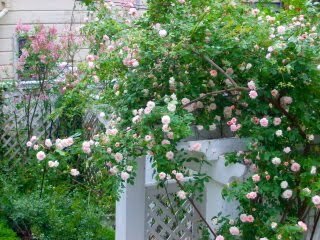 There's almost no way to describe what our Asheville bed and breakfast gardens look like at this time of year...the climbing roses are showing their stuff and the peonies are just bursting forth! Every year I'm speechless (well, at least temporarily!) at the show that is going on around the garden. The colors, shapes and fragrances are something I think I'm prepared for...But every year it's always even better than I remembered! And they don't require a lot of work, so you can really enjoy them without feeling that you need to baby them. 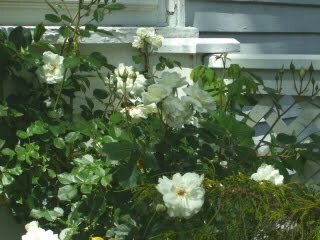 Climbing roses here at Abbington Green Bed & Breakfast Inn include the white r."Iceland"in the Chartreuse Garden, the tiny,pale pink multi-flowered r."Cecile Brunner" in the Parterre Garden and the 19th century, dark pink r."Zephirine Droughin" in the Lower Garden. And while these varieties can all rebloom during the Summer, the first flush in May is the super show that we wait for all year! 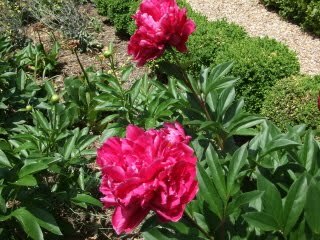 And traditional garden peonies (Peonia lactifolia) are in the Lower Garden and the Cottage Garden at our Asheville bed and breakfast. 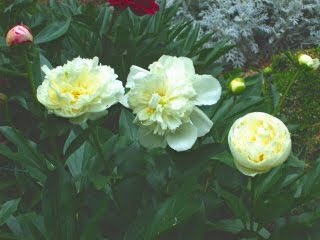 The p."Duchesse de Nemours" are the most fragrant and are white with creamy white centers. 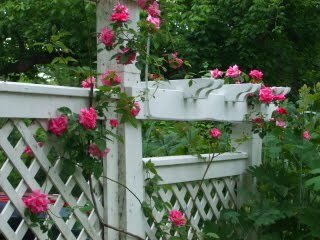 The p. "Sarah Bernhardt" are a multi-layered pink, and the p. "Karl Rosenfield" is a lovely magenta-red. Outstanding!